The current and former astronauts who formed the crews of STS-1, the first space shuttle mission, and STS-135, the final shuttle mission, pose for a group photo in a training facility at the Johnson Space Center in Houston on Nov. 2, 2011. 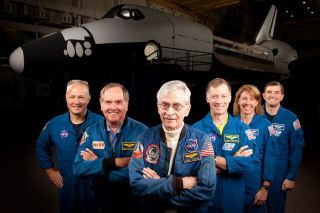 They are, from left, Doug Hurley, STS-135 pilot, Robert Crippen, STS-1 pilot, John Young, STS-1 commander, with STS-135 commander Chris Ferguson, and mission specialists Sandy Magnus and Rex Walheim. NASA may not have space shuttles to launch people into the final frontier anymore, but that hasn't stopped Americans from lining up in droves for the chance to join the agency's iconic astronaut corps during the latest recruitment drive. The U.S. space agency received more than 6,300 applications between Nov. 15 and Jan. 27 during the search for new astronauts – making it second-highest turnout ever and double the normal response, NASA officials said. The all-time record for most astronaut applications was set in 1978, when more than 8,000 people sent in submissions, they added. Only a handful of the new astronaut hopefuls will actually make it through NASA's meticulous selection process. The space agency plans to choose between nine and 15 candidates for its 21st astronaut class in the spring of 2013. Training will then begin in August 2013. Whitson is also leading NASA's astronaut selection board for the latest recruitment drive. NASA retired its three space shuttles in 2011 after 135 missions and 30 years of spaceflight. The three orbiters — Discovery, Atlantis and Endeavour — are now being prepared to be sent to museums across the country for public display. Currently, NASA relies on Russian Soyuz spacecraft to ferry American astronauts to and from the International Space Station, but the space agency is also encouraging private U.S. companies to build commercial space taxis in order to regain an American human spaceflight capability. Meanwhile, NASA is also designing a new space capsule, called the Orion Multi-Purpose Crew Vehicle, and a giant rocket for future deep-space missions to an asteroid or elsewhere. President Barack Obama has ordered NASA to send astronauts to an asteroid by 2025, and then aim for a manned Mars mission. "This is a great time to join the NASA family," NASA chief Charles Bolden said in a statement. "Our newest astronauts could launch aboard the first commercial rockets to the space station the next generation of scientists and engineers who will help us reach higher and create an American economy that is built to last." More than 6,300 individuals applied to be a part of NASA’s next astronaut class, the class of 2013. That is twice as many as NASA typically receives and the second highest number of applications ever. NASA announced its latest recruitment drive in October 2011 to rebuild the ranks of its shrinking astronaut corps. In 1999, NASA had about 150 active astronauts in its ranks. As the space shuttle fleet was retired, many astronauts have left the agency to retire or seek jobs elsewhere in the space industry. Today, the space agency counts 58 active astronauts on its payroll, NASA spokeswoman Nicole Cloutier-Lemasters said. The next step for the 21st astronaut class selection board will select a shortlist of "highly qualified" candidates from the thousands of applications, she added. "The next phase involves medical screenings and initial interviews," Cloutier-Lemasters told SPACE.com. "And, then the final ranking and selection. The final selection is expected in spring of 2013." NASA's most recent astronaut class was selected in 2009, when the space agency added nine new additions to the U.S. spaceflying ranks. Today, those nine new astronauts have completed all of their training and received their first technical assignments inside NASA's Astronaut Office, Cloutier-Lemasters said. "And one, Michael Hopkins, has been assigned to a space station mission and begun his mission specific training," she added. Hopkins is a lieutenant colonel in the U.S. Air Force and has been assigned to the Expedition 37 crew for the International Space Station. The Expedition 37 mission is slated to launch aboard a Russian Soyuz space capsule in September 2013, according to NASA records.